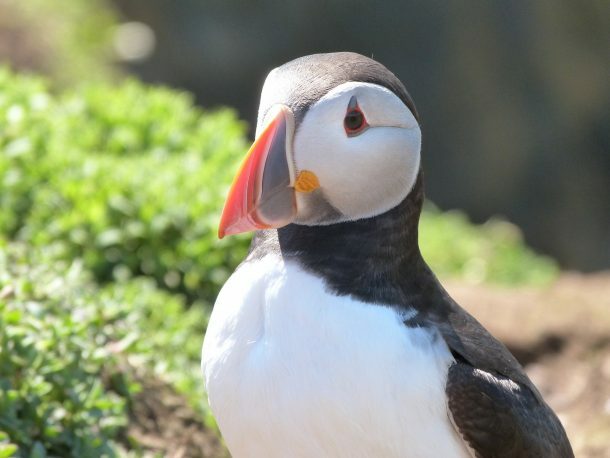 The reason they have been profiled is that the population on Skomer Island, in our lovely Pembrokeshire, is bucking the trend and is growing in numbers(over 30,000 puffins were counted this year), whereas every other population in the world is decreasing at a pace. So much so that they have now been placed on the ‘Endangered’ list! 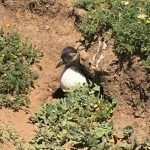 It is hoped that by closely studying the Skomer Population, that they will learn what it is that is making this colony thrive. 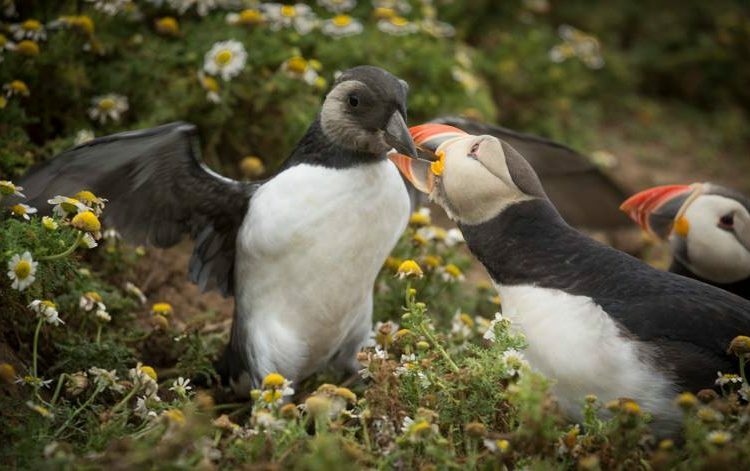 Why are they so successful on Skomer? 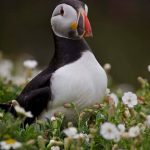 I have been around Puffins for years, and, as a local, we were always under the impression the Puffins were thriving because of our rich waters for food, and I see no reason to believe otherwise. Pembrokeshire has the UK’s only marine conservation area and the waters around Skomer are a ‘no fish’ zone. No one can fish or catch any type of marine life. There is also a protected rare type of seaweed in one of the bays of Skomer that even the boats have to great care when near. Because of all this careful marine conservation, our waters here are very rich in marine life and following on from that is the fact that there is plenty of food for the puffins. The most famous photo you will see of a puffin, is that where the puffin has a mouth full of sand eels. This shot, in flight, wings spread, is on a ‘must do’ for photographers when they visit Skomer, and many people spend hours just waiting to catch this one shot! The sand eels you see, are in fact not eels but small fish, and this is the staple diet of the puffins. When they are bringing them in in this fashion, they are on their way to feed their Pufflings (this is a baby puffin). The pufflings stay below ground in their burrows practically until they are ready to fledge, so it is not often you will sight one until the last few weeks before they make their migration south. 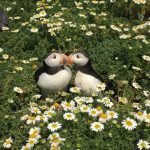 They usually leave Skomer at the end of July/beginning of August, so if you want to see a puffling, a visit to Skomer from the second week of July is when you want to try and come. I am lucky in that I have a great relationship with the lovely people at Lockley Lodge(where you buy your landing tickets for Skomer) and Dale Sailing (the boat ferry) and they keep me up to date with all the goings on at Skomer, the birds, the queues for tickets, so I can give our guests a real idea of when they need to go early or when they can leave it till a little later. At the busiest times of the year, people are starting to queue for tickets at 5.30am!! So, if you’d like to see a Puffling (not as attractive as an adult puffin as they do not have the colours as yet, but still cute) or an adult Puffin (quite often referred to as a clown bird, and if you go see them, you’ll understand why! ), then I suggest you book your stay with us now, without delay–as you’ve probably got 10 days or so left before they are gone again until 2019. We are only about a 20 minute drive away from the embarkation point at Martin’s Haven, so it’s very accessible!